CHAMPAIGN, Ill. - The National Science Foundation announced this month that it is funding a new Physics Frontiers Center at the University of Illinois at Urbana-Champaign. The Center for the Physics of Living Cells is one of nine Physics Frontiers Centers in the U.S., and the second to explore the physics of biological systems. The $7.5 million award will be supplemented with a 10 percent matching grant from the university, bringing the total funding to $8.25 million over five years. 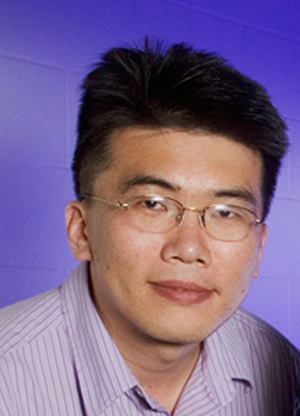 Klaus Schulten, top, holder of the Swanlund Chair in Physics at Illinois, and Taekjip Ha, a professor of physics at Illinois, affiliate of the Institute for Genomic Biology and a Howard Hughes Medical Institute investigator, will co-direct the new Center for the Physics of Living Cells. investigator, will co-direct the center. 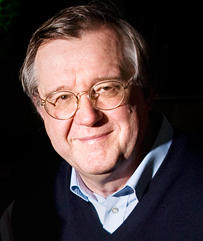 Schulten directs the theoretical and computational biophysics group at the Beckman Institute for Advanced Science and Technology. This group has long fostered collaborations among teams of researchers with very different areas of expertise. The new center will follow this model, building collaborations that can attack current biological problems with all the theoretical, computational, mechanical and imaging tools available to modern science, Ha said. "If you want to study the complex interplay between many different components then you actually have to measure many different things at the same time," he said. Illinois is one of few universities with a significant emphasis on biophysics, Ha said. Seven of its 65 full time physicists study biological subjects, and their collaborative efforts have led to many important innovations. For example, while many laboratories use optical tweezers or fluorescence imaging to measure the behavior of individual molecules, researchers at Illinois (led by Ha) combined the two. Their resulting "force-fluorescence spectroscopy maps" enabled them to detect subtle physical changes in molecules that had never been measured before. Other advances are occurring in the field of computational microscopy, led by Schulten's biophysics group. Using the university's petascale computer capabilities, these researchers are modeling the dynamic interactions of up to a million atoms at a time. Their simulations are capturing events occurring over longer and longer time scales, increasing their biological relevance. For example, a recent simulation explored 10 microseconds of a protein-folding event, Schulten said, "the longest simulation that is feasible today." This achievement was realized through the combined efforts of physicists and researchers at the National Center for Supercomputing Applications, he said. Computational microscopy, when combined with laboratory experiments, can offer new insight into mechanisms that cannot be studied by other means. "There are certain things that you can never measure experimentally," Ha said. "But we can measure certain things and Klaus can simulate them, and if our results agree we can use the hidden things that only he can see to develop new models and design new experiments." Ha and Schulten believe the new center will attract the best young researchers in the field. They are already recruiting six new post-doctoral fellows to join the effort. The recruits will work with 12 center members, including physics professors Paul Selvin, Nigel Goldenfeld, Yann Chemla, Ido Golding, Aleksei Aksimentiev and Karin Dahmen along with chemistry professors Zaida Luthey-Schulten and Martin Gruebele, biochemistry professor Stephen Sligar and electrical and computer engineering professor Gregory Timp. "Biological physics is considered an important frontier field and the students and post-docs need to be prepared for it," Schulten said. The center also will offer faculty and students at other institutions training in emerging biophysics approaches. "It's very hard to pick up the new technology just from reading papers," Ha said. "We'll teach them step by step how to set up their own measurements." Ha and Selvin already have edited a basic laboratory textbook on single molecule experiments, and next summer the center will offer a 10-day workshop on the subject for students and post-doctoral researchers from other institutions who are working in the field. The diversity of biophysics expertise at Illinois has made it a resource, not only for its own researchers, but also for the larger community of physicists and biologists hoping to advance the field, Ha said. "Our center will be a one-stop shop for the most challenging biological problems of the day," he said. "The mission of the Physics Frontiers Centers is to advance the frontier across fields of physics as diverse as quantum optics and the physics of living cells," said Joe Dehmer, director of the National Science Foundation's Division of Physics. "Another significant impact PFCs have is to be a talent magnet for students, post-docs, and other excited young physicists. Promising young talent and new advances can be expected, and we look forward to both from the University of Illinois at Urbana-Champaign." The National Science Foundation award is jointly funded by the Directorate for Mathematical and Physical Sciences (MPS) and the Directorate for Biological Sciences (BIO) as part of a partnership to foster research and education at the mathematical and physical sciences/life sciences interface. Participating programs in MPS include the Physics Frontiers Centers program, the Experimental Physical Chemistry program and the Analytical and Surface Chemistry program. Participating programs in BIO include the Biomolecular Systems cluster, the Genes and Genomes cluster and the Neural Systems cluster. Editor's note: To reach Taekjip Ha, call: 217-265-0717; e-mail: tjha@illinois.edu. To reach Klaus Schulten, 217-244-1604; kschulte@ks.uiuc.edu. NSF contact: Lisa-Joy Zgorski, media officer; 703-292-8311; lisajoy@nsf.gov.